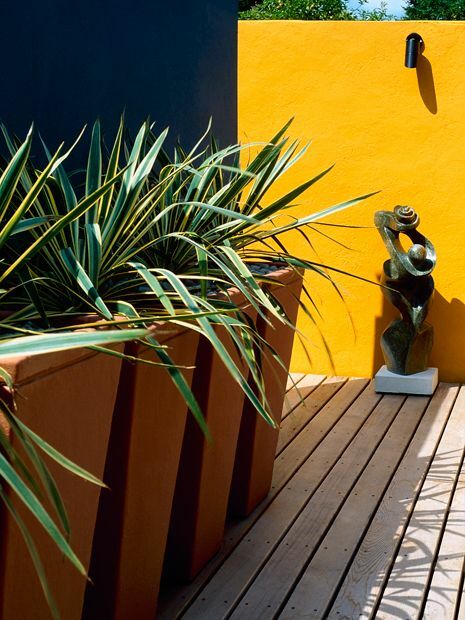 For us, courtyard garden projects evoke an emancipating design freedom; whether sylvan, subtropical or expressed with minimalist restraint, their distinct ambiences, varied microclimates and client idiosyncrasies define well-diversified, private outdoor spaces. From a garden designer's perspective, courtyard gardens and their historical landscape essence provide not only catalysts for fresh design ideas, but also engaging environments to articulate a true sense of place. 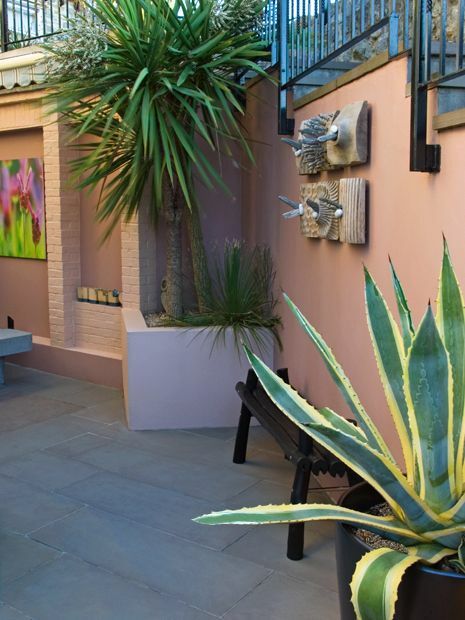 Every thriving courtyard garden tells a unique story – of its place, owners and plants, and the wide-ranging floras we utilise to convey these narratives are truly diverse. From foliage quirkiness to outline sturdiness, foolproof herbage and classic formality, the microclimatic advantages of sheltered courtyard settings enable unusual, personal and eclectic planting design ideas to evolve unboundedly. 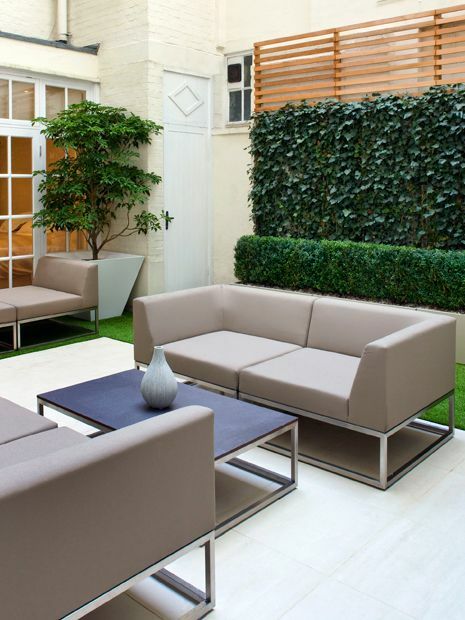 Although London courtyard gardens are often defined by outdoor compactness, nevertheless, when a dual aspect distinguishes a site, we're able to juxtapose distinct floras within an extended microclimate to broaden their cultivation spectrum and architectural design merits. 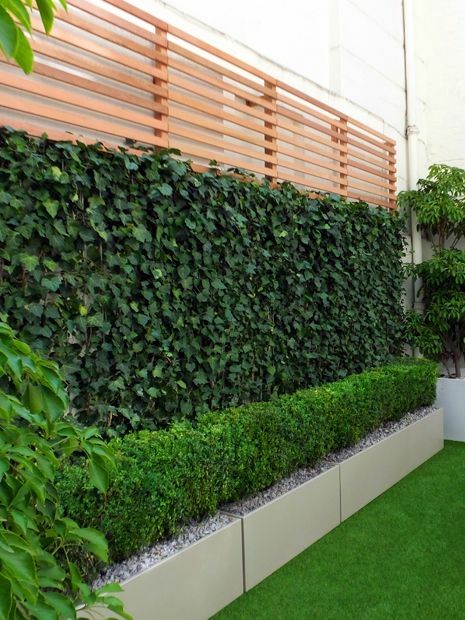 The gamut of perimeter walls which characterises courtyard gardens as individual, standout outdoor spaces is vast, and whether a walled garden framework is preserved as an inherent element, or redesigned to enhance distinctiveness, privacy and texture, it invariably forms a pivotal focal point. This sought-after courtyard exclusivity, articulated architecturally as both the backbone and backdrop of new a courtyard garden design sustains the very idea of a secluded outdoor space, hidden from view and inwardly focused, and its desirability is often expressed when we seek to entirely transform an ordinary urban garden into a fully fledged, bona fide walled courtyard garden. 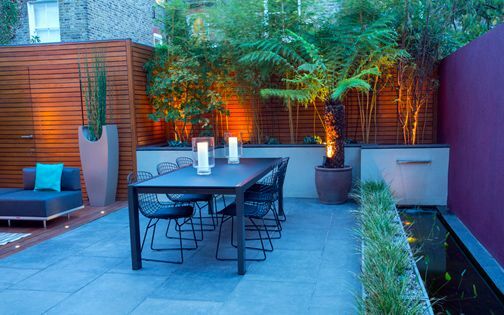 Courtyard garden ideas encompass an equilibrial design breadth, encapsulating historical references within small urban gardens and our desire and need to mitigate relentless city living with outdoor intimacy. 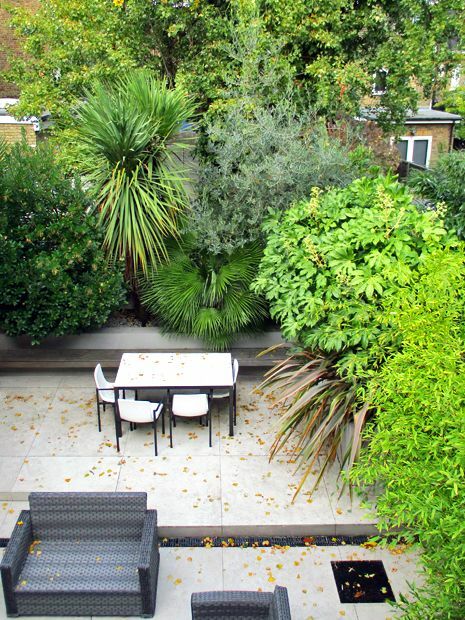 The garden design vernaculars of such aspirations oscillate correspondingly throughout distinct regional landscaping expressions, and generate unique, ideal amalgams in a courtyard crucible en bloc. 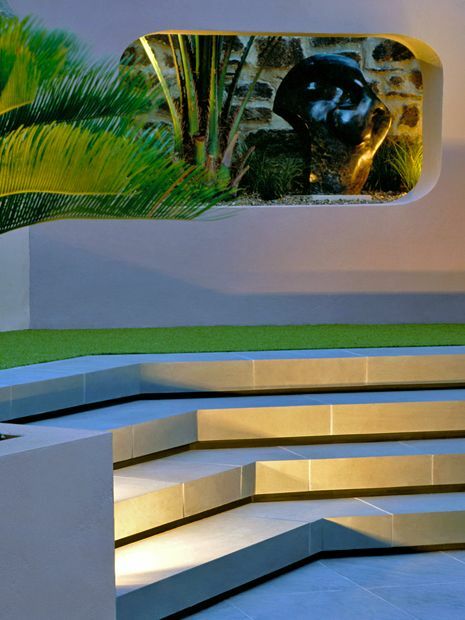 Inspiration for these profuse courtyard design ideas permeates via a myriad of analogously contained sculptural forms, embodied in the miniaturisation of aquatic essence, foliage diversity, textural masonry and the thorough consolidation of universal landscape design ideas. 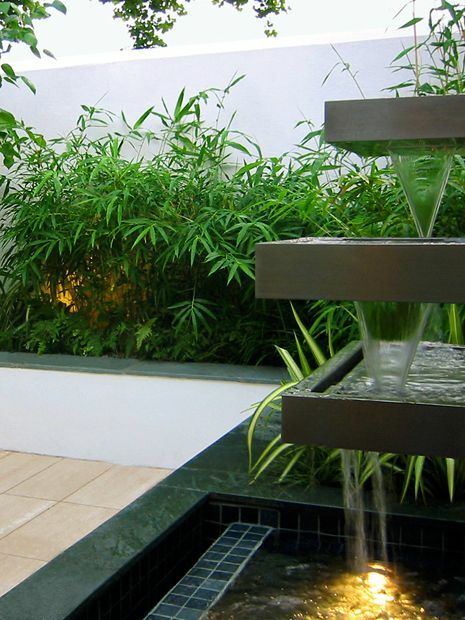 The definitive distillation of water, stone and foliage finds its niche cohesively in the confines of courtyard gardens, where an ambience of calm and naturality, enveloped by sheer timelessness, depicts ideal garden surroundings. 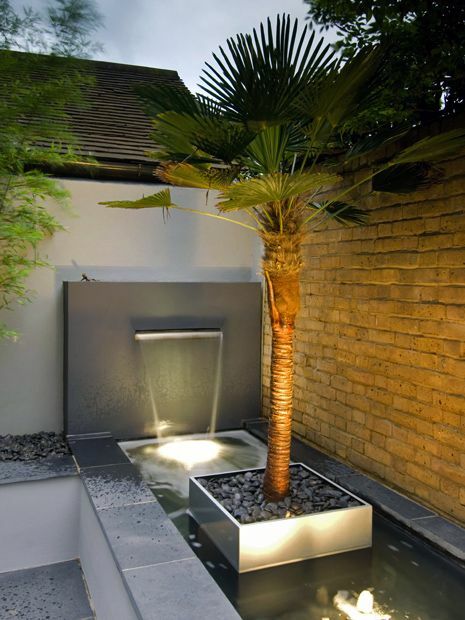 Courtyard garden design ideas in warm climates integrate prevailing heat and inherent water scarcity efficiently into effortless designs which harness climatic, cultural and visual aspects to produce enchanting spatial qualities through the sculpting of water in its limitless nuances. 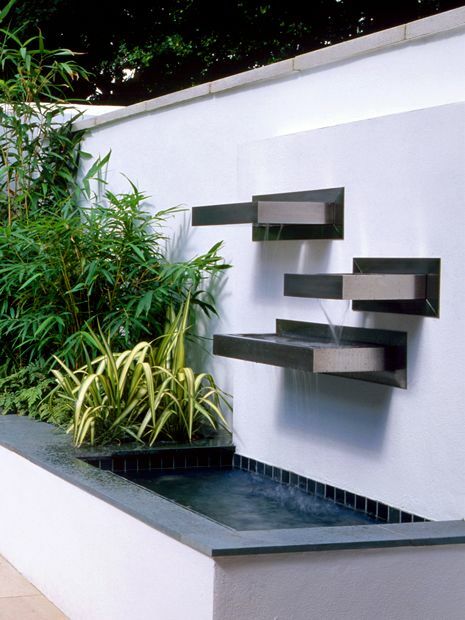 In London's mild temperate maritime climate, the humidity generated by courtyard waterfalls, fountains and pools is effective in sustaining broad flora scopes, and shrewdly alleviating traffic noise. 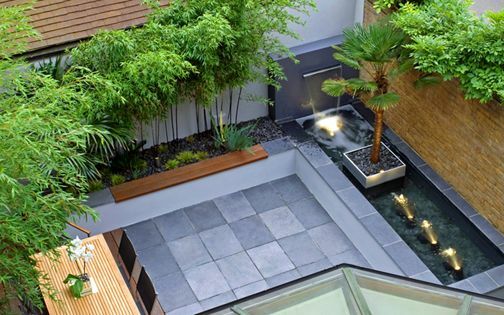 These water courtyard frameworks, when imaginatively augmented by contemporary architectural design, inspire impressions of countless courtyard garden ideas originating in Southern Europe, the Mediterranean, North Africa, South America and Southern US. 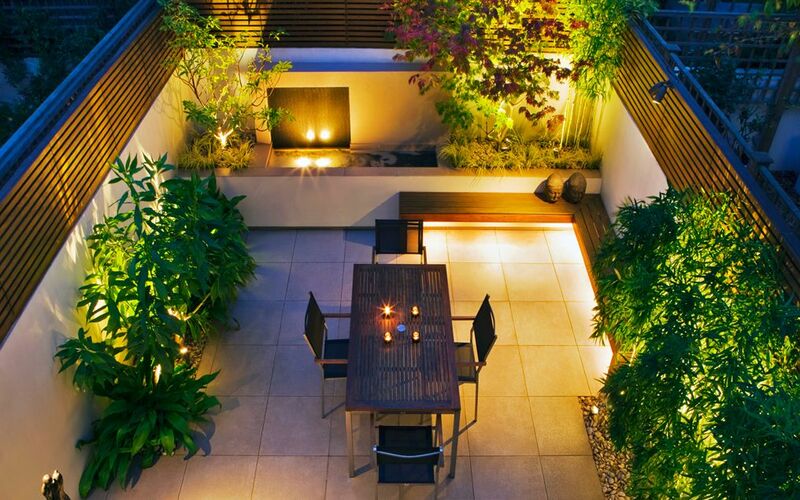 Many courtyard gardens present flat terrains, either intended, or as mere leftover voids between buildings, and in the absence of outdoor unusualness, we originate fresh design ideas in seeking multilayered, engaging garden spaces. 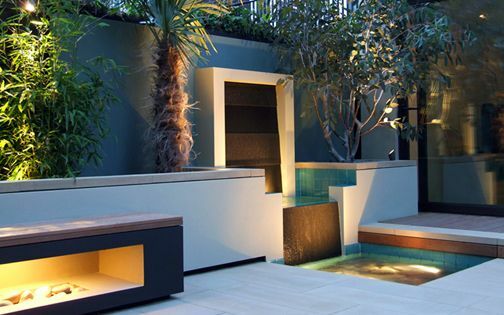 We love the challenge of designing gradients, steps and platforms to fashion interconnected, well-integrated garden layouts, and when a small courtyard garden is designed to maximise usability through external flatness, we formulate raised planting beds, built-in seating areas and accent outdoor lighting, interwoven among dynamic foliage compositions, to counterbalance spatial necessities with captivating interplays of rhythm, scale, shadows and light. 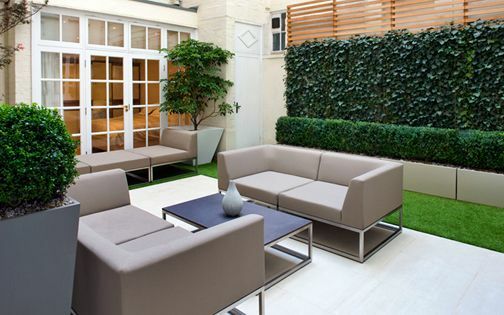 While classic symmetry defines countless large-scale courtyard gardens, in London, where outdoor space is decidedly compact, we utilise contemporary garden design asymmetry to fully extend usable zones and increase a paramount sense of greater depth. By designing distinct, alternating elevations, diagonal focal points and contrasting colour palettes, we layer pivotal sightlines to augment both available courtyard space and our spatial perception, and dynamise inherently static site outlines. 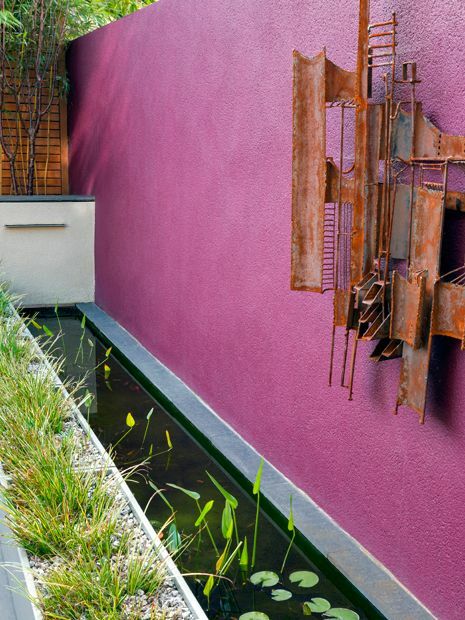 Whether starkly minimalist, exuberantly luscious, or eclectically mixed, a progressive garden design approach refines and interacts with modern courtyards' solid, walled backdrops by innately highlighting and balancing their perimeters to elevate a site's distinctive qualities within its autonomous enclosure. 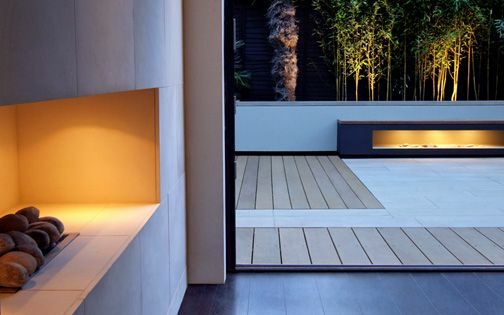 The boundary walls of courtyard gardens, attached to new-build or renovated London homes, present a seclusion irony – typifying lack of privacy in urbanised locations amid municipal height restrictions, and this inner-city conundrum is often alleviated by wood construction. Unlike courtyard garden ideas for internal spaces, coastal, rural and commercial locations, private estates, and spiritual temples, where unbounded architectural freedom enables essential privacy, in urban courtyard settings, we resort to timber resourcefulness in heightening courtyard garden walls and our clients' sense of refuge by designing bespoke cladding. 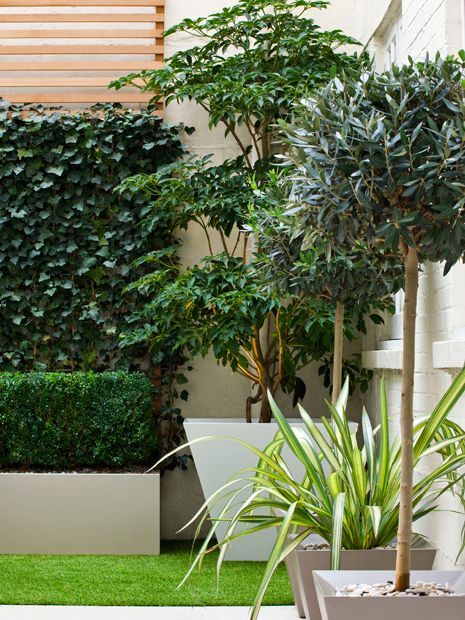 Given UK's profusion of specimen plant nurseries, we instantly green up peripheral zones with dense evergreen foliage, deciduous pleached hedges and fast-growing, tall woody perennials which soften courtyard gardens' continua of vertical hardscape. 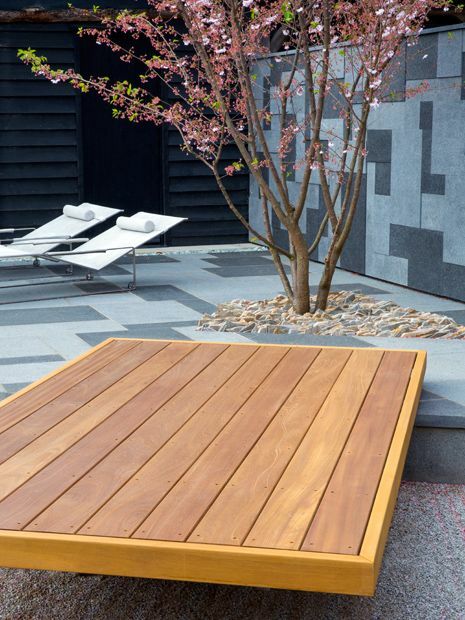 Traditionally paved, courtyard gardens portray permanence like no other outdoor living genre, and with a vast range of porcelain tiles available, we're able to imaginatively advance, expand and strengthen this attribute. 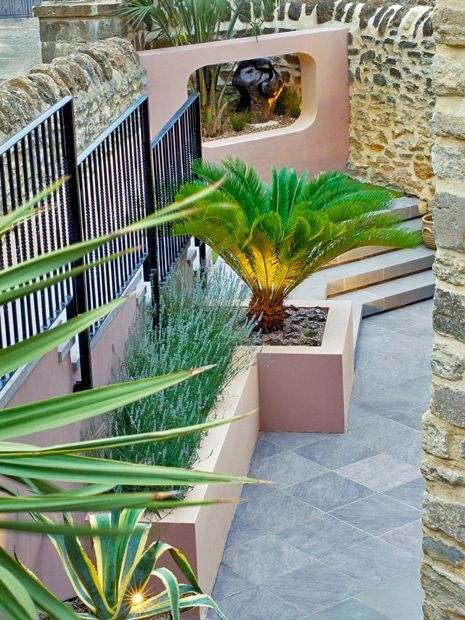 Courtyard stone surfaces largely depict colour, pattern and texture, forming a continuous hard expanse, and while numerous London courtyard gardens are often fairly small, we develop original design ideas to form directional layouts and extend courtyard outline perspectives. 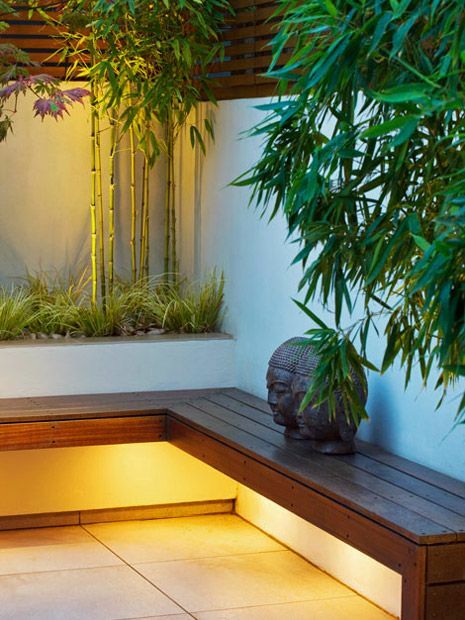 By utilising oversized elements and exceptionally long material lengths to magnify the allotted space, while fusing natural stone, tiles and polished concrete with artificial grass, wood decking and embedded strip lights, we diffuse monotony, lead the eye across central sightlines and promote greater design versatility in visually linking courtyard gardens into their contemporary homes. 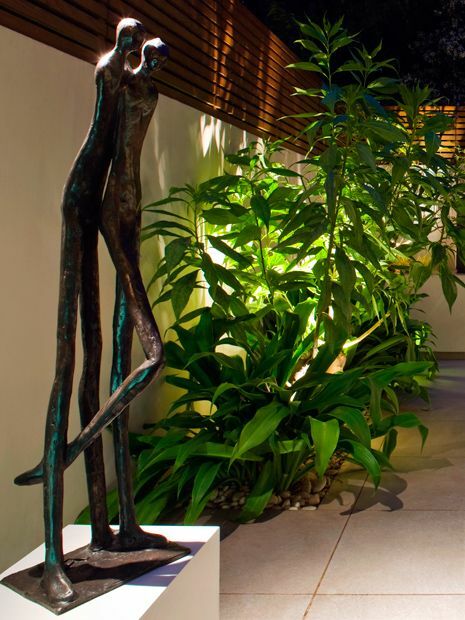 Classically suited for sculpture displays, courtyard gardens not only elevate art focally, but also intimate a lucid reciprocation between culture, design and architecture. 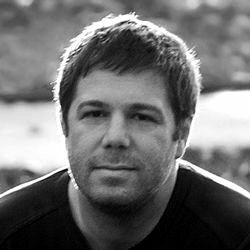 From MoMA's innovative sculpture garden, to the Louvre's statue courtyard and every eminent, private collection far and wide, the garden design ideas which imbue this shared universal aesthetic communicate a profound accumulation of artistry, history and recognition – presented within ideal landscape platforms. 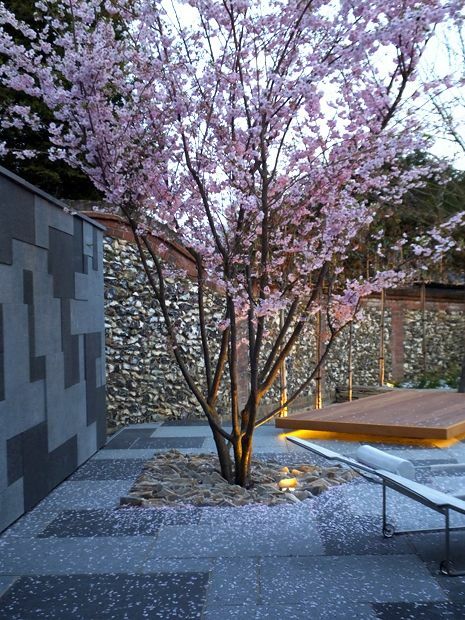 These unique interplays of artwork, foliage and hardscape, amid adaptable sequences, shifting daylight and alternating vantage points, continually redefine our affinity, perception and relationship with man-made objects of beauty in a liberating outdoor context. 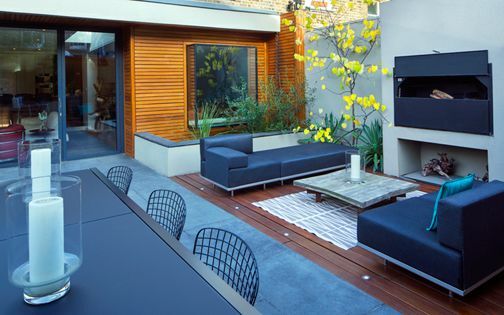 Second only to roof terraces, for us, courtyard garden projects embody ultimate garden designers' autonomy, and while the former discipline, first and foremost, engages in its surrounding cityscape, the latter design practice focuses on the most intimate and personal aspects of private outdoor living. 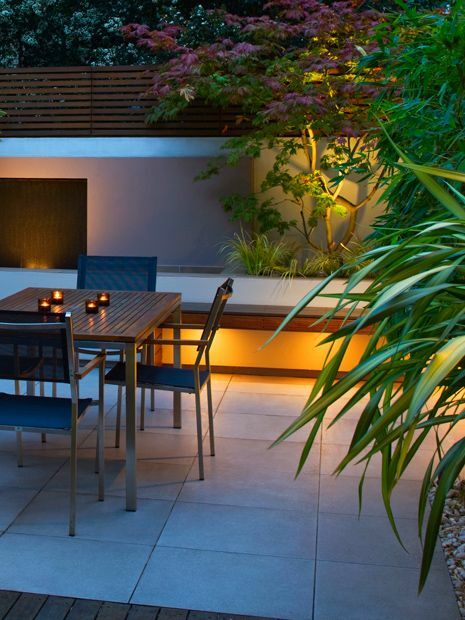 Interestingly, our first two projects were a Chiswick walled courtyard garden and a Hyde Park penthouse roof terrace, and these two design milestones set the benchmarks for an engaging yet highly contrasting canon of work – made possible by London's diverse, architectural framework – reciprocated with highly detailed, passionately individualised, modern garden landscaping. Courtyard gardens imbue the charm of cloistered isolation, within self-contained resilience in utter privacy, and this reassuring outdoor indulgence isn't only a treat reserved to courtyard owners, but also to the garden designers who partake in reshaping these alluring spaces into thriving sanctuaries, where garden ideas and the diverse design principles which communicate them flourish ad infinitum. 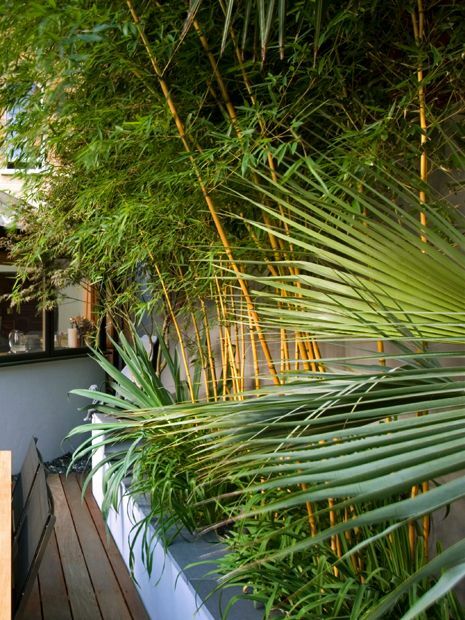 This rather intriguing dichotomy of cathartic comfiness among sheer landscape confines nurtures courtyard culture across vastly varied scales, and in the urban milieu, more than ever, continues to grip our fascination with a contemporary, wholly gratifying, courtyard garden lifestyle.